With the number of displaced people in the world at more than 60 million in 2015 – a total that counts both those living inside and outside of their home countries – the plight of refugees has gained new prominence as countries, including the U.S., have taken in displaced people. To address the issue, the United Nations General Assembly will host a summit on refugees and migrants on Sept. 19, and President Barack Obama will hold his own Leaders’ Summit on the topic the following day. Here are 10 key facts about the world’s refugees as well as those entering Europe and the United States. 1Nearly 1 in 100 people worldwide are now displaced from their homes, the highest share of the world’s population that has been forcibly displaced since the United Nations High Commissioner for Refugees began collecting data on displaced persons in 1951. Displacement levels are higher in some regions of the world than others. For example, more than one-in-twenty people living in the Middle East (5.6%) are displaced. 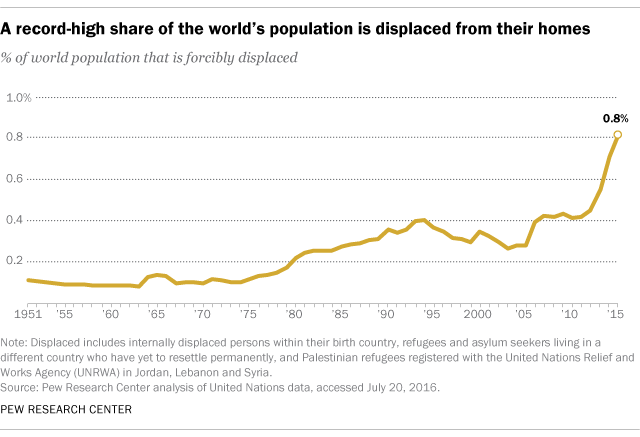 Meanwhile, about one-in-sixty people living in continental Africa (1.6%) are displaced (not including Egypt, which is considered part of the Middle East). In Europe, 0.7% of the population is displaced, similar to levels following the collapse of Eastern Bloc countries in the early 1990s. 2 About six-in-ten Syrians are now displaced from their homes, a number unprecedented in recent history for a single country. The Syrian conflict has displaced millions of citizens since protests against the al-Assad government began more than five years ago. Today, an estimated 12.5 million Syrians are displaced, up from less than 1 million in 2011, according to a Pew Research Center analysis of global refugee data. 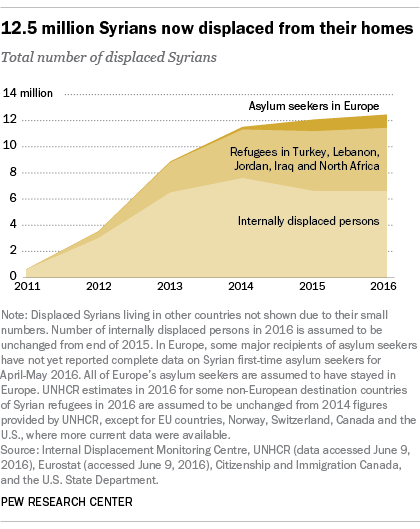 Displaced Syrians worldwide include those internally displaced within Syria, refugees living in neighboring countries or relocated to other countries like Canada and the U.S., and those in Europe awaiting a decision on their asylum application. 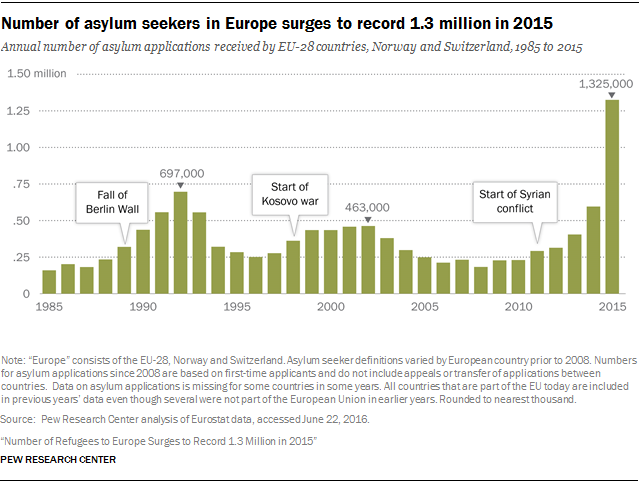 3European Union countries plus Norway and Switzerland received a record 1.3 million refugees in 2015, accounting for about one-in-ten of the region’s asylum applications since 1985. About half of refugees in 2015 trace their origins to just three countries: Syria (378,000), Afghanistan (193,000) and Iraq (127,000). Among destination countries, Germany (442,000 applications), Hungary (174,000) and Sweden (156,000) together received more than half of asylum seeker applications in 2015. 4 The foreign-born shares of populations in several European countries have dramatically increased since mid-2015, as more than 1 million migrants applied for asylum in Europe between July 2015 and May 2016. This growth in the share of foreign born is due to migration of both asylum seekers and economic migrants entering European countries, but is largely driven by the rapid rise of asylum seekers. Sweden saw the greatest percentage-point change, with the foreign-born share of its population rising from about 16.8% in 2015 to 18.3% in 2016. Norway and Austria also saw the immigrant shares of their populations rise about 1 percentage point each during this time. But increases were small for France and the United Kingdom because they did not take in a large number of asylum seekers. By comparison, the immigrant share of the U.S. population increased by 1 percentage point over a full decade, rising from 13% in 2005 to about 14% in 2015. 5Europe has seen a rise in the number of unaccompanied minors seeking asylum, with almost half coming from Afghanistan. Between 2008 and 2015, about 198,500 unaccompanied minors entered Europe seeking asylum, with nearly half (48%) arriving in 2015 alone. Nearly 7% of all first-time asylum applications in 2015 were from unaccompanied minors, the highest share since data on accompanied minors became available in 2008. 6Far fewer refugees are entering Europe in 2016 than in 2015. In summer 2016, an average of about 100 migrants from Syria, Afghanistan, Iraq and other countries have landed each day on Greece’s shores, down from the thousands who arrived daily last summer. 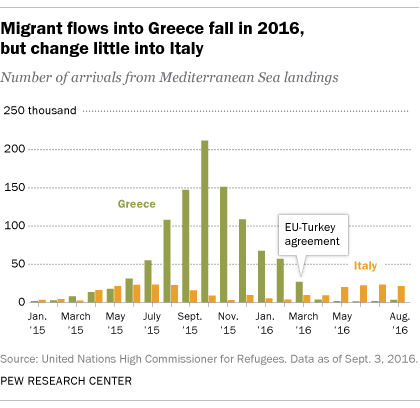 Meanwhile, migration into Italy this year continues at a similar pace to 2015. An average of about 500 refugees, mostly from sub-Saharan Africa, arrived daily between January and August of both 2015 and 2016. 7Europeans overwhelmingly disapprove of how the EU is dealing with the refugee issue, with low marks given by people in all 10 European countries surveyed by Pew Research Center in 2016. The highest levels of disapproval came from the Greeks (94%), Swedes (88%) and Italians (77%). The strongest support for EU management of the refugee crisis was in the Netherlands, with 31% approval. 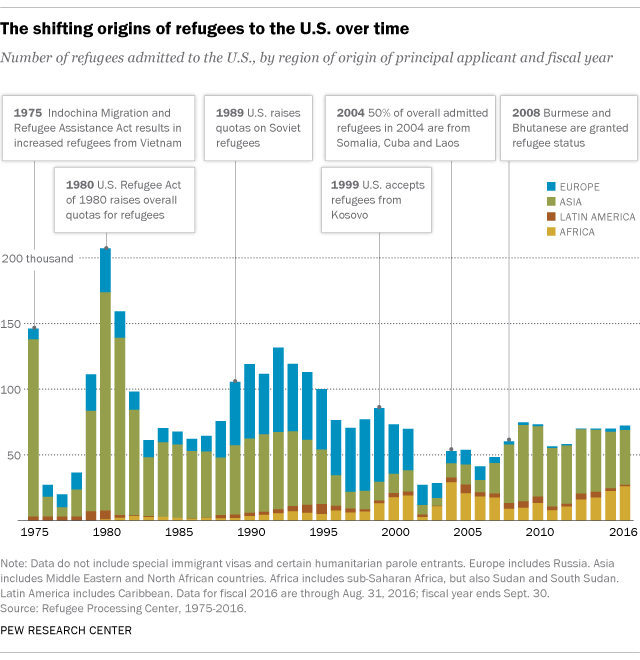 8The countries of origin of refugees coming to the U.S. have shifted during the past three decades. The annual number of refugee arrivals in the U.S. peaked at about 210,000 in 1980 as a result of a large wave of refugees from Vietnam and Cambodia. In the 1990s, an influx of refugees from Europe came to the U.S. due to political turmoil in the former Soviet Union and the genocide in Kosovo. After the 2001 passage of the Patriot Act, which broadened the definition of a terrorist group and what it means to support one, the annual number of refugees allowed into the U.S. dipped dramatically to fewer than 30,000 refugees in 2002 and 2003. But upticks in refugee arrivals started again in 2004 with a wave of Somali refugees. In 2008, thousands of Burmese and Bhutanese were granted refugee status. 9Nearly half of refugees entering the U.S. this year are Muslim. The U.S. admitted the highest number of Muslim refugees in fiscal 2016 of any year since data on self-reported religious affiliations first became publicly available in 2002. 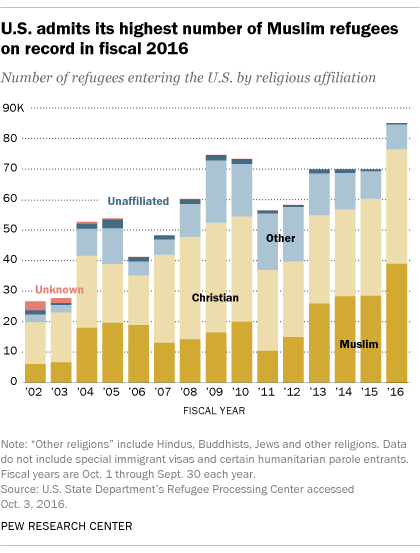 A slightly lower share of 2016’s refugees were Christian (44%) than Muslim (46%), the first time that has happened since fiscal 2006, when a large number of Somali refugees entered the U.S.
10The U.S. public has seldom approved of welcoming large numbers of refugees. In the aftermath of the November 2015 Islamic State attacks in Paris, 53% of Americans said they didn’t want to accept any Syrian refugees at all, and an additional 11% said they would accept only Christian refugees from Syria, according to a Bloomberg Politics poll. 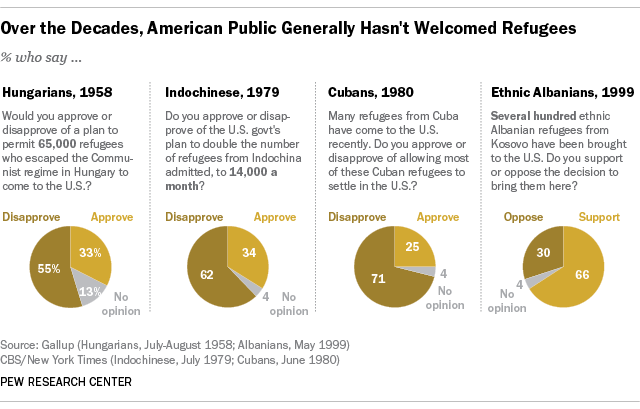 A look back at U.S. public opinion from previous decades shows that Americans have consistently opposed admitting large numbers of foreigners fleeing war and oppression, regardless of official government policy. Note: This post has been updated and expanded from a previous version published June 20, 2016. Note (April 2017): After publication, the weight for the Netherlands public opinion data was revised to correct percentages for two regions. The impact of this revision on the Netherlands public opinion data included in this blog post is very minor and does not materially change the analysis. For a summary of changes, see here. For updated demographic figures for the Netherlands, please contact info@pewresearch.org.